Not only is it finished....but thanks to Waldo...it was finished ahead of schedule. I had a hard time finding a place to take a photograph because it is so long. I hope it goes to a young woman who is very tall...it is one long twin quilt! Here is a close up of one of the blocks. I think it came out nice and there will be a young girl who will be absolutely thrilled to have a quilt of her very own. Next project already underway and hopfully it will be finished soon so I can share photos. It feels so good to finish a project doesn't it? 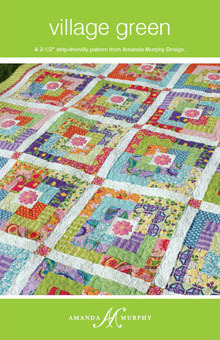 Bejeweled Quilts By Barb TODAY :) Have Fun and please help Barb find her light! I know I'm packing my Beam N Read to take with me to PA next week. We have no electricity at our cabin so you know I'll be wearing mine all week so as not to step on any critters in the night..Yikes! 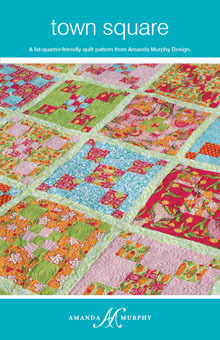 Have you seen these new patterns by Amanda Murphy Design? Talk about cheerful and fun....she has it going on. Amanda has a beautiful fabric line out with Robert Kaufman Fabrics, Ambrosia and Swiss Chocolate. I can't decide which one I like best....they are both so neat. Which one is your favorite? If you missed yesterdays blog posts....you can still go back and leave comments on Madame Samm and Amy's Blogs....there are 10 Beam N Read 6LED Lights being given away!!! There will be Ten...yes 10 Beam N Read Lights LED6 Deluxe Hands Free Lights given away...one per blog....so make sure you stop by each blog for your opportunity to win one of these nifty lights for yourself. Feel free to leave comments on each of the blogs on their assigned days...that's 10 chances....whoo hoo :) If you are a no-reply blogger make sure you leave your e-mail address, otherwise there is no want to contact you and an alternative name will be drawn. You will need to read each blogs post for the details for their requirements for your comment. The drawing is open to the everyone on the globe and to make this possible, the winners will be responsible for the shipping costs of their light to the address of their choice (lights are being shipped from OH, USA). The winner will be able to choose the delivery service (UPS, FedEx, USPS). A special Thank You goes out to the Marketing Manager from Beam N Read Lights, Bob...lets hear three cheers for Bob for making this Blog Hop possible....Hip Hip Hooray....Hip Hip Hooray....Hip Hip Hip Hooray ...THANKS Bob!!! 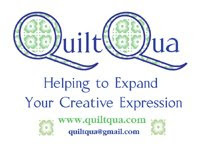 Jean, a wonderful quilt artist friend, was at my house one day and I was showing her all the cool stuff I had tried while in Houston at Quilt Market. I loved the Transfer Artist Paper class I took and loaned Jean my supplies so she could play with it too. Jean used a photo she had from a snorkeling trip and transferred it using Transfer Artist Paper (TAP). When she first loaded it into her printer it was low in ink. She changed the ink cartridge and then put the same piece of TAP into her printer. Can you believe it re-printed in the exact same place and there is no shadow? I couldn't believe it either. Jean signed her name on a piece of paper and reversed it /flipped it and then printed her name on the TAP and ironed it on the back. She said she didn't want to take the chance the ink would run through the piece. I loved her idea. TAP by Lesley Riley is such a cool product. I was able to transfer images to fabric, wood, paper, and canvas in my class. You can also transfer images to glass, mica and metal. When I initially gave Jean my class pack she said she was leery and didn't think she would like it. Much to her surprise she really likes it. "I was impressed with the brilliance of colors that transferred and how soft the fabric ended up being....AND it's washable...that's fantastic!" Speaking of cool....while visiting with Jean today she let me photograph her latest quilt. 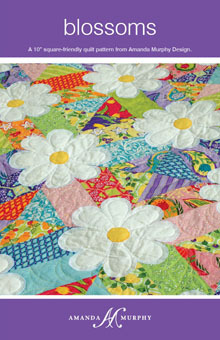 "Sunny Delights" is Jean's own design. She used batiks, silk, ink, swarovski crystals and wool batting. Jean used Halo thread by Superior Threads and bobbin couched the feathers. I loved the shimmer on Jean's feathers....but I couldn't tell what she had used to make them shimmer. Jean took a few drops of All-Purpose Ink and mixed it with water. Then she brushed it over her feathers. The shimmer is incredible....when I first saw her quilt I thought the shimmer was neat but I could not tell how she got only the feathers to shimmer. Guess it pays to file all those tips we learn along the way so when you want to do something interesting....you have the knowledge of what will produce that effect. The flowers are trapunto as are the purple and green leaves. In this close up you can see she painted the quilted circles with fabric paint and then she also used some of the All Purpose Ink over the top to give it some shine. This photo does not show the shine as well as I would have liked it to. Another really neat thing about Jean's quilt is how she pieced silk and batik fabrics in the first layer. I love how the fabrics transition. I thought the feathers were trapunto....nope....Jean used Tuscany Wool Batting. The wool batting gave the quilting that lift. Jean said she learned that from reading Patsy Thompson's blog. This is another quilt Jean has recently finished. I blogged about it previously when Jean was starting this project. If you missed that post, click here. Here it is finished....another amazing job Jean!!! She joined the sections using glass beads. So, now I'm home and I'm all fired up....the project I'm working on now is a baby quilt . What are you working on? Did you learn anything from this post? I hope so....I enjoy sharing and love reading other bloggers tips and tricks too. 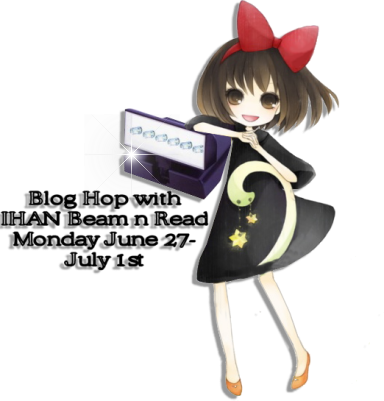 A friendly reminder that on Monday the IHAN Beam N Read Blog Hop starts....so make sure you get around to all the bloggers listed below and leave a comment on their post for your chance to win one of 10 Beam N Read 6LED Hands Free Lights....compliments of Reading Light and I Have A Notion ...aka IHAN. Just in case you were wondering if Waldo and I finished our quilt as you go project by Friday (today our deadline....issued by Waldo herself)....YES....it was finished last evening....Hooray for Waldo and her determination to get this done. She didn't quite use a cattle prod on me to get it done....I think she was thinking about it though!! I have to say it really is great to have the right tools for the job. I am a person who gets annoyed when things don't go smoothly and I've found myself annoyed a few times with this project. These are the 10 count package of Wonder Clips. They also come in 50 count packages. If you are like me you are thinking...why do I need these...I could use the metal clips for paper right? That was my first idea too...then I remembered Clover came out with these new clips and I wanted to try them. What I like about the Wonder Clips is that they did not crease my fabric and there is no risk of tearing your fabric like with the metal ones (I've actually done that). They have a nice grip and I dropped them on the floor a few times and they did not break....which to me means they were made well with good quality and strength plastic. The other neat thing about the Wonder Clips is they have a 1/4 and 1/2 inch seam allowance markings on the clips....and the clips lay flat. As you can see in the photo above, I've clipped the roll together. Before I did that, I found myself very frustrated the roll would unwind and I kept having to move my hand that was guiding the fabric through my machine to straighten the roll....then my stitching was crooked. It does not take too much ripping out to tick me off .....really now...lol. We have to fold and pin the fabric that will be the binding and the borders for this quilt as you go project. I kept getting the fabric wobbly and I found it hard to grab the glass head pins that I love....so I grabbed the Clover Flower Head Pins and gave them a go. They were perfect because I could grab the head so much easier with my fingers and they were nice and long...holding that fabric for a greater length. Now I'm not saying our binding and borders are perfect....although I'd like you to believe that....but I did find the Flower Head Pins to be a great help. If you read my last post you know I'm having to be creative to get my sewing in between work and family. I know another woman who not only juggles the same things I juggle...she has 4 children!!! Its true, Amy Ellis, author of Modern Basics, is the mother of 4 children from ages 2 to 9. She knows what it is like to sew in her kitchen too :) Amy seems to focus on the pleasure of creating and the joy of making a quilt and her designs really reflect her focus well. I've had Amy's book for some time now and I've enjoyed looking at every last page of it. Martingale & Company have given me this and several other opportunities to review some great books. 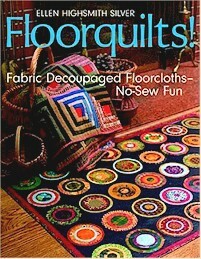 I can only show you a photo or two...so I chose the cover and one of my favorite quilts inside the book. This quilt is called, 1, 2, 3. It can be put together rather quickly and I know each of my girls could make one and each quilt would be totally different because of the fabrics they would each choose. They are in the 20-something crowd and yes I do allow them to use my sewing machines when they are home (if they break one...I'm taking it out of their inheritance...lol). I have so enjoyed reviewing Amy's book and I hate to part with it....I have loved it and want to pass it along to an IHAN Blog Follower. If you would like to have my review copy of Modern Basics please leave a comment on this post telling me why you want to have this copy. I'll choose a winner by random number generator on Friday June 24, 2011. Good Luck!! PS....you may or man not have noticed there is a new button at IHAN....New Products...check it out! A week ago today, Mrs. Rosemary (Waldo) and I went to a quilt as you go workshop. The purpose of learning quilt as you go was to get more twin size quilts to donate to charities. One of our guild members, Carol Hicks, was kind enough to lead the workshop. Basically we pre-cut large squares of fabric and centered a smaller piece of batting and then began adding strips. 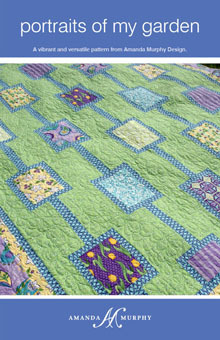 Later we will put together all the squares and the quilting will have been done as part of the piecing process. AND her wrist pincushion. I loved her wrist pincushion.....who wouldn't smile with that on their wrist? How darn cute is this? Jenny said she made it a few years ago at Quilt University....that is what she could remember and something about the number three and fiber. I'm guessing it was the amazing gals at Three Creative Studios that taught the class (I'm not sure but I've sent them an e-mail to find out). Waldo and I are working on the same quilt. We decided we might be more successful in completing our charity project by July's meeting if we work on it together. I had the center fabric squares and some coordinating fabrics. We both searched our stashes to find anything that would coordinate and we came up with enough strips to make at least one twin quilt. The block below is another way to set up the blocks...if you have a print for the center. I really liked this placement too. There is a variety of ways to lay them out...I guess you just choose depending on what fabric you are starting with. My two cents on the quilt as you go method....it does use up quite a bit of thread because you stitch, stop, cut, start, stitch, stop, cut....and all on small strips. I find it a bit mind numbing at times...but you have to remember it takes some really striking colors and designs to keep me awake in the first place...LOL. I really enjoyed the workshop and all the gals who were there too....I think that was the best part....it usually always is for me anyway. I think I'd use the method again....when the opportunity presents itself...for perhaps a small project or I'd make larger blocks....then it would go faster. That's what I've been up to....what about you? PS...if you have not visited Three Creative Studios recently....oh geez....go over and check out their blog and their website. 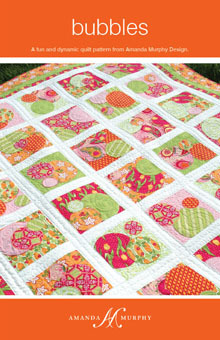 They always have something fun going on and lots of free tutorials and patterns too! What does Rit Dye and Mod Podge Have In Common? 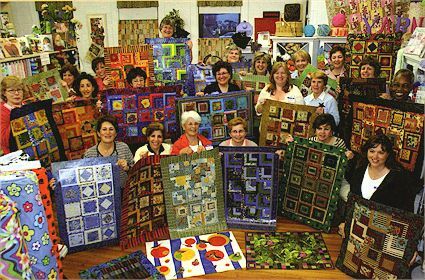 A Floorquilt Class....beautiful aren't they? Ellen has come up with a new method for sealing her Floorquilts using Rit Dye and Mod Podge (You know Mod Podge Rocks don't ya? ). Eddie from the Rit Dye Blog even posted photos and a tutorial here. Check it out...it is perfect for a summer project and fast too. I was recently telling someone about using Roc-lon Multi-Purpose Cloth to make Floor Cloths/Quilts. So if you didn't know you can use up some fun fabrics by making a Floorquilt....now you do :) If you have some Rit Dye..check out the tutorial above...you could have a really spanky project to show off to your family and friends. "At the Northern terminus of the Appalachian Trail stands Mount Katahdin, the highest peak in the State of Main. IN the native Penobscot Indian language "katahdin" means "The Greatest Mountain". 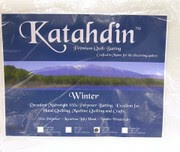 Like Mount Katahdin, we believe you will find our Katahdin Premium Batting to be the greatest, highest quality quilt batting available today." Below is a sample of hand quilting using Bosal Katahdin Premium Cotton Batting 3oz Summer weight. Hand quilting done by none other than the IHAN East Coast Head of Operations and "Master Hand Quilter", Mary Jane. She whipped this up as a sample / trial run. MJ is going to be doing a whole cloth quilt soon and she wanted to make a sample block before she selected her batting. I asked MJ how she liked working with Katahdin Batting and this was her reply, "It needled very nicely and was soft. It holds the design well and had a consistent, even, smooth texture and it has no voids. I really like it"
"I have a new favorite batting. I just finished my third machine quilted wall hanging with Katahdin summer weight--their lightest weight batting--and it is now my batting of choice. 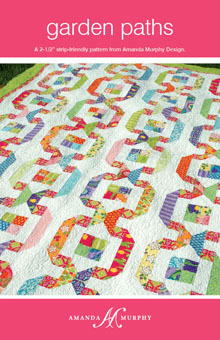 Because it has no scrim, it is extremely soft so that the quilt drapes beautifully and it is very easy to sew through. But whatever kind of needlepunching they do to make the cotton hold together, they have found the secret of making a product that holds its shape and that I love to work with. I will also be using the autumn weight--slightly heavier--in some projects, but I will definitely keep a good supply of summer on hand." 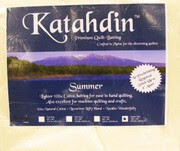 Katahdin Summer 3oz Premium Batting is Lightweight, 100% Organic Natural Cotton Batting Ideal Weight for hand quilting but stable enough for Machine Quilting. 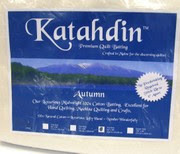 Katahdin Autumn is a Premium Midweight 100% Organic Cotton Batting Ideal for Machine Quilting and Crafts. Katahdin Winter is a Midweight 100% Polyester Micro-Denier Batting Ideal for Machine Quilting and Crafts. Katahdin Peemium Batting is available at IHAN in the following sizes: 45" x 60", "72 x 90", "90 x 96", and "108 x 90" and by the roll, 90 inches X 30 yards. While discussing Batting....I think I'll also tell you about Bosal's Batting Seam Tape. It is the only Batting Tape I'll use. I love the weight of it and I have found it very easy to work with. Waldo and I are working on a quilt as you go project for charity. The batting needed to be cut 10" x 10" so this gave us an opportunity to use up scraps of batting we had.